Habitat : Moist deciduous to evergreen forests. Uses : This plant is used medicinally both in the Modern Western Medical system and also in Ayurveda, unani and folk medicine. It helps to reduce blood pressure, depresses activity of central nervous system and acts as a hypnotic. Snakeroot depletes catecholamines and serotonin from nerves in central nervous system. 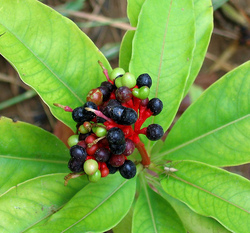 Refined snakeroot has been used extensively in recent years to treat hypertension. It is used as an antidote to the bites of poisonous reptile like snakes. It is also used to treat dysentery and other painful affections of the intestinal canal.